Take a vessel and heat milk. Add cooked rice and sugar and let it cook for around 15 minutes. Stir it occasionally. If you feel rice is not mixed properly you can mix it with blender but not too much otherwise rice will break and then mix it with milk. Add saffron and elaichi powder and cook for about 5 minutes. 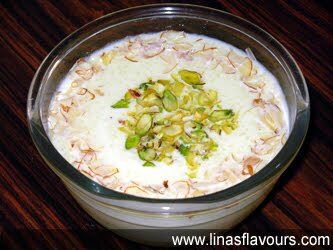 Garnish it with almonds, pistachio, cashew nuts and serve it hot or cold as per your liking. This takes very little time if your rice is ready. You can make a sweet dish for your family as a surprise in no time.